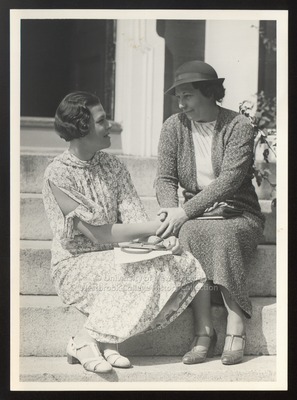 "Catherine Gott, Westbrook Junior College, 1936"
Catherine Gott and Mrs. William Gott sit on the steps of Alumni Hall, Westbrook Junior College, in this black & white, circa 1936, photograph. Catherine wears a light floral dress with three-quarter length sleeves. Her hair is parted on the side and loosely finger waved or marcelled. Mrs. Gott wears a suit, a collarless white blouse and a felt hat. Both wear shoes with straps and nylons, and both hold small handbags and notepads in their laps. Mrs. Gott clasps Catherine's hand in both of hers--perhaps saying goodbye as Catherine begins college?